Two Delaware schools that focus on serving children with learning differences have merged to create a unified pre-kindergarten through twelfth grade program on a 23-acre campus along Kennett Pike. The merger between Centreville School and Layton Preparatory School became official on Aug. 1 and the new school, Centreville Layton School, is now the only independent school in Delaware or Pennsylvania offering a comprehensive pre-K-12 program for students with learning differences. The two schools enrolled 130 students during the 2013-14 school year, 95 at Centreville and 35 at Layton Prep. Barton Reese, who served as the head of Layton Prep, is now the head of Centreville Layton School. Deborah Maguire, who previously served as the acting head of Centreville School, is now the assistant head of the merged institution. Centreville School was founded in 1974 as the Delaware Learning Center, a formative play program for children with learning differences. The school gradually expanded into a pre-kindergarten through eighth grade program that moved to its Kennett Pike location in 1984. 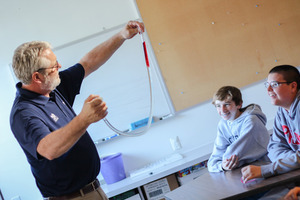 Layton Prep opened in 2005 with a class consisting primarily of ninth-grade students before expanding to serve all high school grades. Layton Prep was originally located in the New Castle Corporate Commons before moving to the Centreville School campus in 2012. Because the two schools already shared a similar mission, the merger is a very logical next step, officials at the schools said. Most of the families served by the schools are residents of New Castle County, but some live in southeastern Pennsylvania and nearby communities in Maryland and New Jersey. Photo courtesy Dragonfly Leathrum Art is an important part of the curriculum. According to Reese, the merger was not a surprise to those familiar with the two schools. The boards of the two schools had begun exploring ways of sharing resources almost as soon as Layton moved onto the Centreville campus. The merger is expected to enhance and expand the academic, social, and cultural opportunities for current and future students, while also creating efficiencies in both the academic program and the business office. “The faculty and staff of both schools are very excited for the merge,” said Dragonfly Leathrum, the director of marketing for the school. “The merger also provides both stability and sustainability for both programs and helps to ensure that we will continue to serve as many children as possible for a long time,” said Edward B. Rosenthal, chairman of the Centreville School Board of Trustees. Some of the unique offerings of each school will now be available to all the students at Centreville Layton School. For example, the language, speech, and occupational therapy services that have long been a part of the Centreville program will now be available to all students. “We are excited to offer this additional access to counseling and therapy services to students in our upper school,” Reese said. He is also excited about the lush and expansive 23-acre campus for the merged schools. Maguire talked about the benefits of having a pre-kindergarten through high school program housed on one campus like many traditional private schools in the area. Even those not enrolled in Centreville Layton School can access therapeutic and tutoring services through Centreville Learning Center. Anyone seeking information about admissions or academic programs at Centreville Layton or the learning center should contact Reese at 302-571-0230, Maguire at 302-571-0230, or visit the new website at www.centervillelayton.org. Photo courtesy of Jennifer Burns Students enjoy a science experiment. Centreville Layton School provides a comprehensive Pre-K – 12 program for students who learn differently and those who seek a more personal academic experience. Numerous challenges to the learning process can interfere with a child’s ability to succeed in a traditional academic setting. Our students build skill sets and develop learning strategies so they can overcome challenges, achieve academically and thrive socially. Our talented faculty, our numerous support services, beautiful facilities and sprawling campus provide our students and families an ideal academic setting where students can grow, achieve and be successful.